Smell and taste are intimately related, so much so that we casually speak of flavor as a unitary perception even though it’s a fusion of sensory information from different receptors and nerves. Taste being limited to the perception of sweet, sour, salty, bitter and umami, most of what we regard as flavor is really contributed by smell. The proof is simple: just pinch closed your nose the next time you try a fine wine or a piece of pizza. Minus the nose food and drink are reduced to texture and the most basic of tastes. The olfactory contribution to flavor is delivered by a reversal of the usual process of smelling. Instead of sniffing at food through our nostrils, we get its aromatic impression via the nasopharynx—the back of the throat. The act of swallowing sends food aroma from the mouth to the nose by the back door. The 19th century American philosopher, critic and food writer Henry Theophilus Finck described this as “the second way of smelling.” Psychologists today prefer the technical term retronasal olfaction, but I like Finck’s version just fine. In What the Nose Knows, I point out that the second way of smelling is a special feature of human physiology. Few other species savor their food as we do in the act of eating. Predators rip and gulp, herbivores grind away, humans luxuriate. Retronasal olfaction has unique psychological characteristics as well, many discovered only recently by sensory researchers. What this adds up to, in my view, is that the human nose evolved to serve the human mouth. Our hunting dogs may be better adapted to scenting distant prey on the wind, but we are unsurpassed at drawing the nuances of a flavored venison stew. I believe the transformative moment that gave rise to the genus Homo, one of the great transitions in the history of life, stemmed from the control of fire and the advent of cooked meals. Cooking increased the value of our food. It changed our bodies, our brains, our use of time, and our social lives. It made us into consumers of external energy and thereby created an organism with a new relationship to nature, dependent on fuel. Wrangham’s thesis is elegantly laid out in Catching Fire and I won’t attempt to trace all the threads he has woven into it. Simply put, he looks at two important transitions in the evolution of modern humans. The first occurred 2.5 million years ago when the habiline lineage emerged from the chimp-like australopithecines that preceded them. Habilines were larger and bigger-brained and used primitive stone tools, all the better to skin big game. The second transition took place 1.8 million years ago with the appearance of Homo erectus, a proto-human that walked like us and even looked like us, with a small mouth, smaller jaw, and smaller teeth. Until now, anthropologists had settled on the Man-the-Hunter hypothesis to explain the emergence of both habilines and Homo erectus. Bigger brains made for more clever hunters and weapon makers, bigger bodies for better long distance travel and rapid pursuit, and the whole mix encouraged more cooperative social behavior. Everyone agrees that consistent meat eating made a big difference in human evolution. But a closer look at Man-the-Hunter shows that the hypothesis doesn’t square with what we know of the dietary economics of hunter-gatherer societies. Wrangham’s a audacious idea relies on a detailed reading of the fossil record—the dating of campfire sites, refuse middens, and pollen grains. Suffice it to say that new evidence keeps pushing back the date for the first use of fire by proto-humans. Wrangham’s hypothesis is more than plausible. 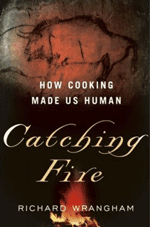 Catching Fire was published after my book, so I relied on Wrangham’s earlier scientific papers to describe his ideas. In my chapter “A Nose for the Mouth” I take the ball and run with it, pointing out that cooking produces novel smells (carmelized and roasted notes); that the domestication of livestock produced new food smells (milk, yogurt, and cheese); that the domestication of grains produced new smells (gruel, bread, and toasted notes); and last, but not least, that fermented alcoholic beverages produce even more. Add to this the new studies showing that olfactory receptor genes evolve rapidly, especially in the past 20,000 years during which domestication of animals and crops took place. The resulting picture, I argue, is one in which human olfactory abilities are fine-tuned by evolution to create higher-resolution flavor perception. In effect, our nose evolved to serve our mouth. I just got around to Catching Fire and enjoyed it. It’s a captivating story, well-told: science in a conversational tone. Given my obsessive focus, I looked eagerly for what Wrangham had to say about smell. Surprisingly little it turns out. In one passage he describes how modern non-human primates prefer sweet and cooked food, just as we do, and how these preferences may be hardwired in our brain. In another, he vividly describes the taste of various fruits in the chimpanzee diet. Wrangham is my kind of scientist: a field guy who just rolls up his sleeves and tries a mouthful of Pseudospondias microcarpa fruits. Verdict: inedibly bitter due to high tannin content. Conclusion? The shifts in food preference between chimpanzees and humans suggest that our species has a reduced physiological tolerance for foods high in toxins or tannins. Since cooking predictably destroys many toxins, we may have evolved a relatively sensitive palate. I agree. I also think there’s a lot more good science to be done in the paleo-anthropology of olfaction. Let’s get out there and do it. I invited a chef 2 weeks ago to make something for my blog, something related to the sense of smell and taste. I thought it would be very cool. I will send him this article, maybe it will inspire him! Keep trying. I met a chef & "food designer" a while ago who is interested in smell and historical cuisines. We had an interesting lunch. P.S. I can't imagine anyone saying no to you.